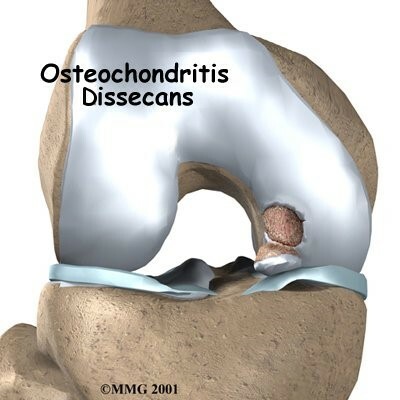 Osteochondritis Dissecans (OCD) is a disease in which localized osteocartilaginous separation at the level of the subchondral bone causes damage to the protective articular cartilage cover, subsequently producing pain and swelling. Unless the lesion repairs spontaneously or it is treated, the disease process progresses. The affected area of subchondral bone and its attached articular cartilage can become loose and separate into the joint. In fact, this is the a common source of loose bodies in the knee joint. OCD lesions may occur in any joint, but are most common in the knee. OCD is most common in people between the ages of 10 - 50 years old, with more men being afflicted than women. To repair OCD lesions we applied our Arthroscopic Articular Cartilage Paste Grafting technique that has been used by Dr. Stone for the past 20 years to treat arthritic and traumatic lesions of the knee in over 500 cases with excellent pain relief. A study of the 2 - 12-year outcomes of Articular Cartilage Paste Grafting to treat arthritic lesions was published and can be found here. The goal in treating arthritic lesions, traumatic lesions, and failed OCD lesions with Articular Cartilage Paste Grafting is the same. The intent is to stimulate a healing response that covers the lesion with a protective layer of fibrocartilage and/or hyaline cartilage. 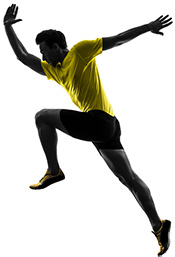 The regenerate cartilage protects the underlying bone and serves to reduce pain and swelling. Articular Cartilage Paste Grafting has been successfully applied to OCD lesions as both a primary treatment and as a salvage procedure for defects that fail other attempts at repair. If you would like to download a copy of this study, please click here.